Neil Aspinall. 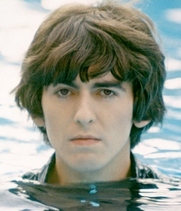 George Harrison. Terry Gilliam. Paul Mccartney. Eric Idle. Ringo Starr. Jane Birkin. Dhani Harrison. Eric Clapton. Pattie Boyd. Olivia Harrison. Yoko Ono. Tom Petty. Ravi Shankar. Phil Spector. George Martin. Jeff Lynne. Klaus Voormann. Astrid Kirchherr. Ray Cooper. Jim Keltner. Jackie Stewart. Biopic. Recommended. Documentary. 01 Ade tastics. Music. 01 Dave W (Whisky) Faves. ‘Living in the Material World’ features private home videos, photos and never before heard tracks to trace the arc of George’s journey from his birth in 1943 to his passing in 2001. This is a deeply personal film of Harrison’s life. Ringo Starr, Eric Clapton, Paul McCartney, Yoko Ono, Olivia and Dhani Harrison, among many others, talk openly about George’s many gifts and contradictions, and reveal the lives they shared together. A vivid, fascinating and revealing labour of love from director Martin Scorsese.